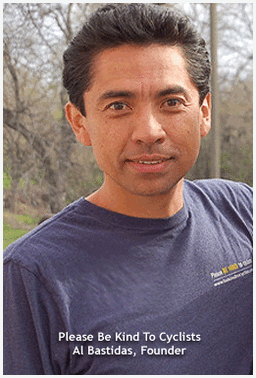 Austinite Alvaro Bastidas believes it's a beautiful world out there. "I've met so many people through this experience and I've learned how beautiful people are," says the 39 year old after his brush with death changed his world on September 14, 2002. Things didn't look so beautiful on that day. While cycling on his way to the popular Austin Tri-Cyclist Saturday morning ride, Al's life was changed in an instant when a vehicle traveling in the opposite direction made a left hand turn in front of him. Without time to react, he struck the side of the vehicle with his head, catapulted on top of the roof and then flew 10 feet in the air to finally topple to the asphalt. Al was rushed to the hospital and immediately underwent brain surgery to place tubes in his head to drain fluids around the brain. His head swelled up twice its normal size. While Al remained in a coma for two days, doctors gave him a 50 percent chance to live. His three sisters and mother flew from Florida that day to be at his side. With tubes coming from his mouth, nose, veins, and packed in a bed of ice to keep his 105 degree temperature regulated, Al was a far cry from the fit triathlete who had completed several local triathlons since he started the sport three years ago. "It's amazing how when a tragedy like this happens how people come together. In our hearts we all have this love. We just cover it up so much with our daily stuff. What I found out is people are full of love," says the father of two daughters ages two and six. "Everyday when I wake up I have a smile on my face because I know people love me so much. I could have died." For 11 days, Al fought for his life in Intensive Care. According to the doctors, most people would not have made it though the trauma Al suffered. His strength to rebound, says Al, can be attributed to his triathlon and marathon training. "I think that you're body responds very quickly to get better because of training in the past." A three time finisher of the Motorola Marathon and regular participant at local triathlons such as the Burnet Tri-hard, Southwest Texas Tri and the CapTex Tri, Al found how caring the triathlon community can be. He received over 200 cards and over $4000 in financial support from neighbors and fellow triathletes to get him through the Christmas season when the company he was working for as an engineer faced financial hardships and was no longer able to provide him with an income. His masters swim team, Austin Aquatics, raised a total of $1400 for the Bastidas family and provided Alvaro with a free membership for 2003. When it was discovered that the driver of the vehicle had only the minimum liability insurance of $20,000, which barely covered even a week of medical expenses, the neighborhood association set up a medical fund at the Bank of America. While Al continues his recovery and the medical bills accumulate, he is thankful he now is at least able to receive a portion of his salary through his long term disability insurance. "If you look at the bad side, it's been a bad experience. Fortunately for me, it hasn't been as bad as it could be. Yes, it was almost worth it being hit by a car. It's beautiful that people can love you so much," says Al who has rebounded miraculously from two life threatening head injuries, a broken wrist, a cut nerve in his right hand which impaired his thumb and two fingers, a long cut in his left arm, bruised bones in the legs and a knee injury which makes running painful. During the 11 days in ICU Al started responding, taking in food that was spoon fed by his mother, and stood up with a walker. The damage to the brain was serious however. He lost his memory, his voice, his balance - he was starting over. He moved to a regular hospital room and then finally moved on to Health South rehab where he underwent intensive therapy that makes triathlon training look pale in comparison. Under the direction of four doctors and a physical therapist, he started his new training regime - a triathlon of life skills. He engaged in cognitive therapy to start to remember things, speech therapy to get his voice back and physical therapy for his legs and hand. Reestablishing his balance has been a big reminder of the things we take for granted. "It has been an experience which has been a gift and a lesson -- when you have to learn how to brush your teeth again and hold your pen. The things you take for granted like your balance are extremely critical." While in rehab Al had many visitors like fellow Austin triathlete Keith Ponnan who had met Al at the gym and turned him on to triathlons. Says Ponnan of his visit, "It was tough on my mind to see a fellow athlete like that. I think race car drivers never visit fellow drivers in the hospital for the same reasons." Al was lucky that tragic day. When EMT staff found him unconscious and bleeding on the road, he had no ID on him, and no medical alert of his allergy to penicillin. He hadn't been able to find his wallet before leaving for the ride, so it was by sheer luck that when his wife Pat went out for a run 20 minutes after he had left, she came upon the scene and noticed the bike crushed on the ground looked like her husband's. Police waived her on, but then she saw Al's ripped jersey on the side of the road and decided to turn around. They opened the ambulance and Pat was able to identify her husband in time before he was rushed to the hospital. "If it wasn't for her, I could have been much worse if I suffered from an allergic reaction," reflects Al. Since the accident Pat left her job as an accountant to be there for Al and to manage the family, the medical bills and insurance and the lawyers. "My wife is very supportive. She handles the shopping and taking the kids to school. That part hasn't been easy. If it wasn't for my wife and the rest of my family, I'd still be in a wheelchair."